The Former Corn and Produce Exchange building is listed at Grade II and sits within the southern boundary of the Cathedral Conservation Area. A grocery and provision market was first established in the area in medieval times. A permanent building was first erected in Hanging Ditch in 1837. Construction work on the present building, to meet the growing requirements of the North West's Grocery and Provision Traders, began in 1891 in a piecemeal fashion and continued for a period of 12 years. Following severe bomb damage in December 1940 the interior of the building was largely. However, the interior was completely destroyed following the IRA bomb attack in 1996 and very little original fabric now remains internally. 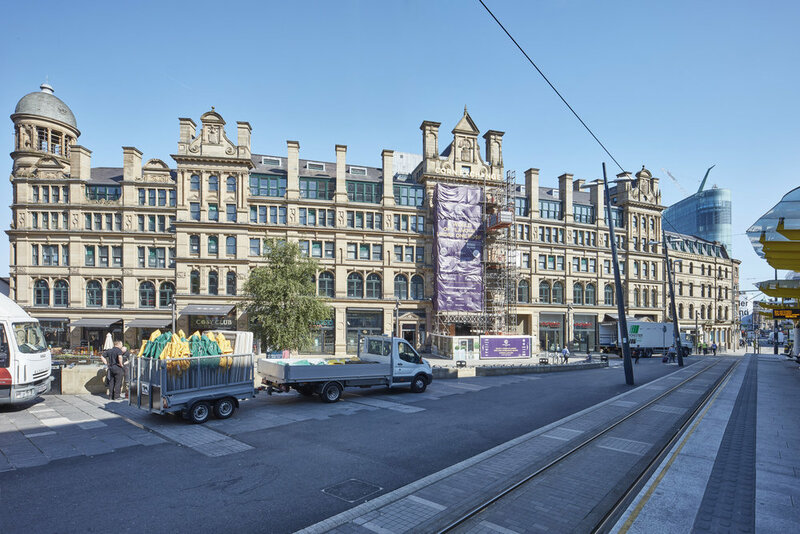 The restoration project was completed in 500 days and a new interior, designed by the Ratcliffe Partnership, provided 55 retail units on three floors. 800 window frames were replaced and 1,700 metres squared of glass was needed for the dome. It was rebranded as ‘The Triangle’ shopping centre and opened in 2000. SLHA has worked with the multi-disciplinary project team since 2011 to develop and implement a phased refurbishment of the Grade II listed building, which has addressed historic building repairs, public realm, signage, lighting, new uses, and access, to transform the unviable shopping centre in to a destination food and beverage outlet and hotel.